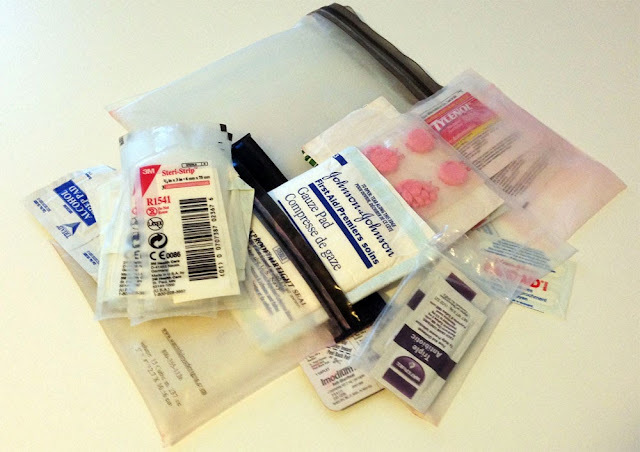 I made up a few of these basic, low-profile First Aid kits back in 2010. One went into my EDC bag, and has since been restocked and repacked several times. The other went into my wife's purse, where it has remained and been plundered as needed since. It was slightly different than the kit I built for myself and the contents list linked above, but fairly similar - minus some of the larger bandages, super glue, allergy meds, etc. The kit became part of her daily carry since then, getting moved to different bags and used on a fairly regular basis when out and about. Motivated by finally running out of bandaids, she recently reminded me that it needed to be restocked. Probably a bit of an understatement. Having spent 3 years in several purses and diaper bags, I thought it was interesting to see what had fared well under the wear-and-tear, what had been used up and what hadn't been needed in 3 years of daily use. None of the medication was really used--the kit had Tylenol, Imodium, and chewable Pepto. It's all expired at this point. My wife is not a big medication taker. The Pepto was smashed into a fine powder and the packaging failed, spreading a pink dust over many of the kits contents. I would avoid these in the future. Anything bandages for a wound larger than a small cut was mostly unused - butterfly closures and gauze pads. Steri-Strips were added at some point and went unused, too. Bandaids! All long gone, and I'm fairly certain it's been restocked once or twice. Also, the wife reminded me that while she was on a cruise without me (can you believe that?) my brother (yes, this was with my immediate family) cut his knee pretty bad on some rocks while they were on a random beach in Bermuda. A few of the gauze pads, gauze tape and large bandaids were used to patch up his wound. This was a couple years ago, and the stuff used up was never replaced. Safety pins are long gone. My wife also raided my stash of safety pins in my EDC bag. The Gorilla tape is also gone, but I'm fairly certain it was ditched from the kit at some point, not actually used. The kit has two aLoksaks--one large one, and one smaller within the kit. Neither will reliably seal at this point and are worn to heck, but they did do the job of holding the contents and generally protecting them from wear. They need to be chucked out and replaced. Not sure if I'd buy these again, but for a couple bucks each, they should be viewed as a disposable step up from a ZipLock freezer bags. It also had a pair of little bulk-pack zip baggies from the craft store - these are $2 or $3 for a hundred or so. They were held within the large aLoksak and are also worn to heck at this point, but they still seal, where the small aLoksak doesn't. The wifey needs more of a boo boo kit versus a first aid kit. I'll still include a few things for dealing with a larger cuts, but more bandaids for the kid's various nicks and scrapes are what she really needs. Medication did not get used, so we'll trim back there, too. To stand up to the long term abuses of riding in a purse or diaper bag, I'm going to invest in a sturdier container for the kit - probably one of the small Maxpedition pocket organizers.